Our flash fiction challenge today from terribleminds.com is actually quite ingenious. I’ve never thought about asking a random word generator for my story ideas, but I think the concept is quite effective! So, Chuck received 5 randomly generated words for us to use in the story: “Figure”, “Dusk”, “Flirt”, “Mobile Phone”, “Wig”. It came to me almost instantly. We have 1000 words, and I managed to trim it down to 999! Yay me! Enjoy. “Do you think she wears a wig?” she asked, fidgeting in an oversized chair in her living room, cell phone at her ear. “Oh, I’m sure you don’t notice; she’s out of your league. You’re way too… smart for her.” She giggled but soon stopped, worried that he would notice how obviously she was trying to flirt with him. She glanced out the window. Dusk had descended upon her quiet street, making silhouettes out of houses, vehicles parked on the road, and the odd maple or oak. How could she rectify this situation? “Excuse me?” she demanded, standing up now to pace, appalled that this man she’d had a crush on for two years had actually turned out to be such a jerk. Sam turned away from her kitchen and peered back out the front window. While every object appeared the same colourless gray against a violet sky, one shadow stood out. 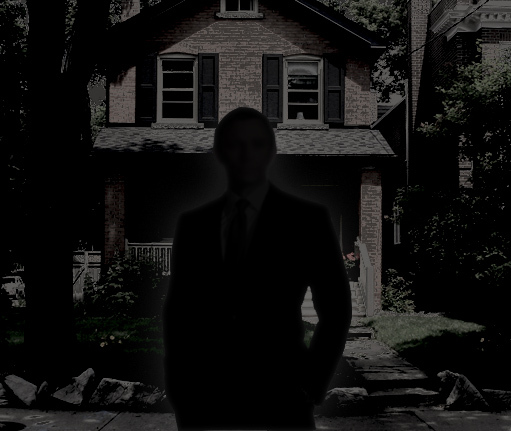 The figure of a man stood on the sidewalk before her house. Her heart sputtered in her chest before picking up speed. “Is… is that you?” she whispered. She glanced behind her, saw the bottle of wine that she’d planned to crack open by herself sitting on the kitchen counter. Maybe things would progress further than she had planned. He had, after all, come all the way here to see her. “Okay,” she said and entered the front hall. After flicking on the porch light, she opened the front door. Mark, now standing in the glow, pulled his cell from his ear and snapped it shut. He was wearing a long overcoat, still in his work clothes. It was a good thing she had been too nervous about making the call to change out of her own. “Is that wine?” Mark asked, indicating towards the kitchen. He nodded and meandered into the kitchen, removing his overcoat and suit jacket and tossing them onto the back of the couch. He loosened his tie and approached the kitchen. Mark yanked open the drawer beside the fridge and pulled out the corkscrew. He held it up before her with a sideways smirk. When they had sat down in the oversized chairs by the window, facing one another, Sam set her glass down on the side table. “Curious?” Mark asked. He sneered. Sam nodded and stood up to close the blinds, simultaneously glancing about the room for blunt objects. Before she was able to sit, Mark grabbed her by the waist and stood. He yanked her close and leaned over to smell her neck. Startled, Sam tried to push away, but his strength exceeded hers. “Sickening—?” She tried to wriggle out of his grasp, but now he was kissing her neck, nibbling her ear. His left hand gripped her right biceps, bruising. “I hate you so much,” he said. He hit her in the jaw, causing white stars and pain to fire through her limbs. While she recovered from the blow, he pushed her into the chair. Seconds later, he had duct tape in his hands, was wrapping it around her head. She tried to claw at him, but his strength and size had been one of the things that she had been attracted to. Tears streamed down her face. Sam shook her head in panic, tried to beg, but her words were muffled. The next day, Sam successfully covered the bruises and cuts with makeup. When she and Mark crossed paths in the office that morning, her lingering terror deepened. “I’ll see you tonight, Princess. Save your energy,” Mark whispered and passed her with a sneer. dark is the word that comes to mind, I am a huge fan of criminal minds and even though I wasn't surprised at the way he turned out to be. To be lonely and desperate is a sad and bad combination. Even worse is to have a crush fro two years, really sad. I agree. I always wonder what kind of things go on behind closed doors that we don't know about, things that would shock us if we did know. Love writing about criminal minds, too. Thanks for commenting! Awesome story, I woke up thinking about it. I voted five stars. Wow, that's flattering! Thank you! I may have just yelled "No Sam! You dumb girl!" at my laptop. Which is the kind of reaction I love to get from a story. ooo if only she'd grabbed that corkscrew and stuck in his eye! lol! Great tension Lindsay! Nice… there's sort of a dual tension there between seeing how you're going to incorporate the words and the story itself. Loved it. @Benjamin – I enjoy seeing how everyone incorporated the words or ideas, too. If I have additional tension, that's super!